Usually website owners do not want their clients to be annoyed with the password strength notifications. I was asked a couple of times to customize WooCommerce strength meter and after that the idea to create this tutorial appeared. On the screenshot below you can see how the password strength meter works by default. 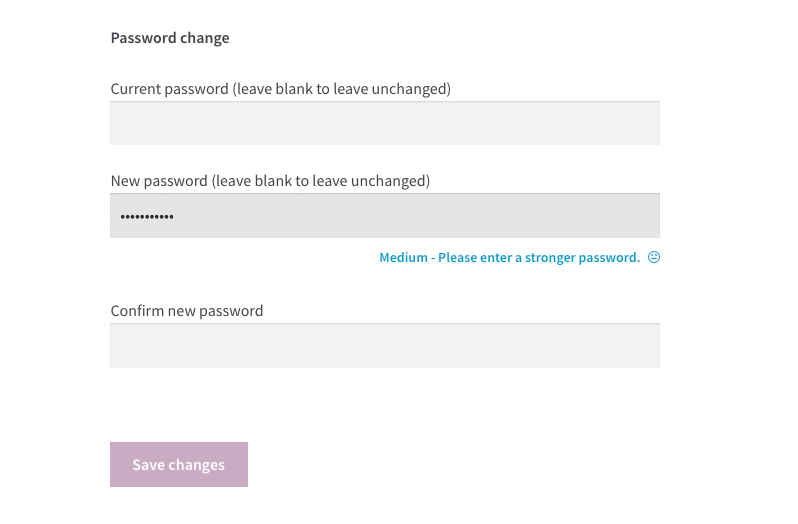 “Save Changes” button becomes active with Medium password strength. But keep in mind that the Checkout page accepts all passwords, it just shows the strength meter messages. And the below code allows to change that. You can configure it the way that any passwords will be accepted or only strong passwords will be allowed – just as you want. I decided to ask users for the most strongest passwords here. Only strong passwords will be accepted when you set Strength Meter value to 4. By the way, there is another action hook that allows to set the minimum accepted passwords strength. And with this hook you can also change the password error message and the hint. And we can also change “Weak”, “Medium”, “Strong” messages! Let’s do it. If you do not care at all what passwords your customers will use, insert the following piece of code to your current theme functions.php and that’s all you need to do. The password strength meter will be deactivated on both My Account and Checkout pages. hi, the above code works great. how would you change it for the reset password page, that one still calls for a hard password. Hi there… I’m getting the following warning that’s filling up my log file when I use this code. Any ideas why $Data isn’t being passed through as an Array? Hmm.. for me it works without warnings. Try to print_r( $data ) and look what is inside. Lots of people are with woo 3.3+ I’ve changed the code to use the supported approach now. Since this method is deprecated. I replaced the deprecated wc_password_strength_meter_params filter hook with the actual one woocommerce_get_script_data. I just leave the old code here for anyone who are using the old WooCommerce version. More info about the deprecated hooks replacement is in this tutorial. I need password length strong for ‘8’, can anyone help me where I need to change please? Thanks man. It worked perfectly on the latest woocommerce as of today.